Isa began her career as an actress in Theatre, Television and Film. She also performed her own solo shows on the Edinburgh Fringe. She has taken a play into Wormwood Scrubbs and performed it to the "lifers" . As her background is from the world of performing arts , her workshops have a physical and dynamic quality to them, which makes them a compelling experience. She has been screened by the Criminal Records Bureau. 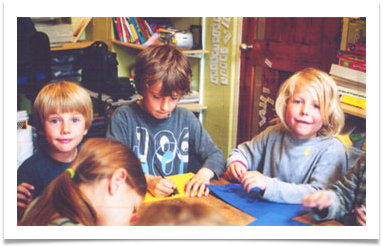 Art for All painting and creativity workshops are flexible tailor-made art packages designed and adapted to suit all sectors of the community. 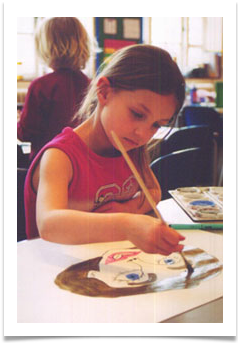 aptitude for art in the classroom, herself. to find herself the painter of some 400 paintings. 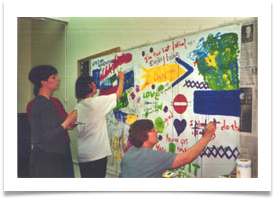 As a late starter in the field of the visual arts, she feels that individual creative expression is a very powerful field of energy, (often untapped), in every one of us, whether we are old or young, rich or poor, sick or well. 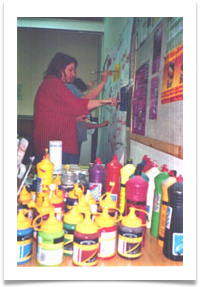 Art for All workshops are primarily safe places to explore with colour, joy, paint, music, meditation, rhythm and verbal sharing, the depth of expression within oneself. They use paint, collage, drawing, wire mesh, clay and pastels. 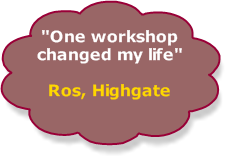 The workshops are non-judgemental, non-interpretive and non-analytical. They lean on fun, spontaneity, connection, communication and the wonderful world of self-discovery. They look into creative blocks, inhibitions and creative isolation. and lives in Highgate and has a studio in Wood Green.